Tulum! Not just for beautiful hip people on yoga retreats. It's also a perfect spot for a family vacation! Tulum really does have it all – the warm gentle sea, gorgeous boutique hotels, delicious food, and tons of activities. While beach vacations are often very alluring, personally, I tend to get bored fairly quickly laying on the beach all day. Sure, Tulum has plenty of great beaches, but one of my favorite things about it is that there are tons of other things to do from exploring multiple ancient ruins to swimming in countless cenotes. Plus, with a child I am always looking for vacations that are easy to get to (direct flights). Getting to Tulum couldn't be easier. You can find cheap flights directly to Cancun and then it's a simple 2-hour drive south to get to Tulum. 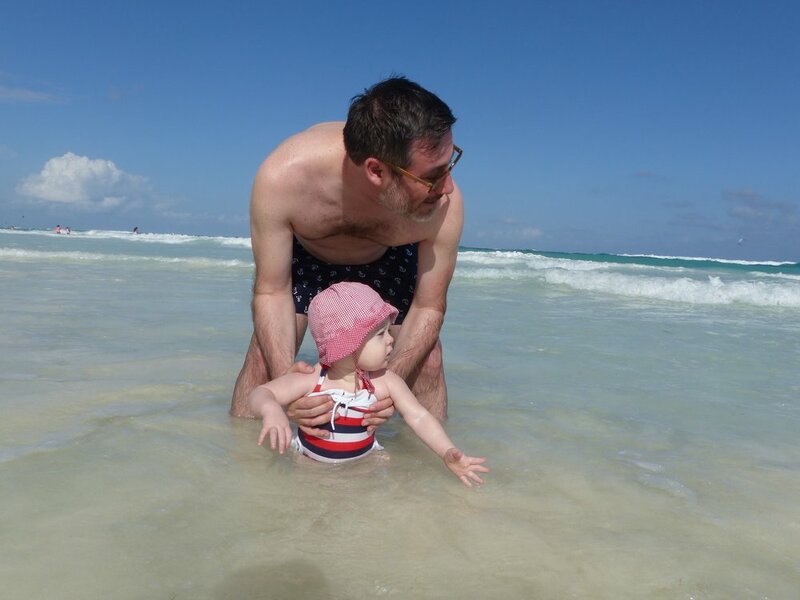 Sally was 11 months when we went to Tulum with her and I had visions of her playing in the sand at my feet while I feasted on guacamole washed down with Pacifico. Like most things with a baby, things aren't always what you expect. It turns out, Sally wasn't that into playing in the sand at all, which is all the more reason I was thankful Tulum offers so much more than just beaches. The lodging in Tulum is an embarrassment of riches. Along the main beach strip there are countless boutique hotels that all look fairly similar, which is to say that they all look amazing! On this trip we stayed at Suenos, which is towards the end of the main road along the beach, and I highly recommend it. (We have stayed at Nueva Vida before, which I also highly recommend.) This time we went off a friend's recommendation as Suenos is one of the few hotels in Tulum that has a pool (and Sally loves swimming). The pool is a nice feature to have as an option, but truth be told, the water was pretty cold when we went so we ended up not even going in. But regardless, the hotel itself is beautiful! We picked a room on the ground floor so we didn't have to deal with the stress of Sally trying to crawl over a balcony (something to think about with a baby who's mobile). The room was great! We had a private (almost enclosed) little outdoor zone with a table and chairs where Sally could cruise around and play with beach toys. QUICK TIP – We've found that often hotels will have beach toys left behind by other families at the front desk that they'll happily let you borrow, saving you from having to bring them along or buy them on your trip. And some even have leftover sunscreen! The beach in front of the hotel is quiet and beautiful, with raised beds to relax on. The beaches provide waiter service as well with both food and drinks available all day (so I was able to live my "Pacifico and guacamole while Sally plays" fantasy to some extent when she cooperated). All in all, Suenos is an excellent choice (with or without kids)! Let's talk RUINS!!! Tulum is an excellent home base to check out many of the various Mayan ruins and each boasts their own unique features. On our previous trip to Tulum we took the 3-hour drive to Chichen Itza. Chichen Itza is one of the "big dogs" when it comes to Mayan ruins. When we saw the main structure for the first time, I had one of those surreal experiences of having learned about it in college years ago and then BAM, I'm standing right in the middle of it! We sprung for a personal guide (which you can easily find at the entrance), which I would definitely suggest. He walked us around and taught us a ton about the Mayan culture and the various structures on the grounds. Next, are the Tulum Ruins. These ruins are in Tulum proper, right there on the coast. It's quite a site to see such ancient ruins overlooking the water. A must see, but something we'd visited on a previous trip! Again, we hired a guide and took the walking tour at our own pace (I included a couple of those photos below too). Finally, on this trip we decided to visit the Coba Ruins, which was an easy 45-minute drive from Tulum. What makes these ruins special are a few things. First, they are in the middle of the jungle which is visually pretty different than the other ruins we've seen. Second, one of the structures you can actually climb to the top of! Luckily, I had the Sally excuse for not climbing them (definitely not because I'm lazy, gulp). But Alan made the quick but steep climb. (A quick aside – I've breastfed Sally everywhere from the Grand Canyon to Muir Woods, and was able to add Coba to the list. Alan and I joke that we should make an "epic places to breastfeed calendar". Who wants one? Nobody??) The third and best feature of the Coba ruins is that there are cheap rickshaw-type bikes available where a tour guide pedals you all around the grounds! They're not only fun, but a great way to get around the large grounds (again, definitely not because I'm lazy... sort of). What is so wonderful about all of the different ruins is that they are ALL totally different, and ALL well-worth checking out! Next up... CENOTES! Cenotes are natural swimming holes that are basically underground caves with crystal clear water in them. They were carved out by underground rivers, the water is fresh and a nice temperature, and there are SO MANY OF THEM (each with a different vibe)! Some are more secluded and cave-like and others are more like recreational swimming holes. On this trip we popped into a few. Some were tricky with Sally especially because we didn't have any sort of life vest for her and they were quite deep. But the best one to take her to was the Grand Cenote. This is a popular one, not far from town. Here's a quick tip – if you go to the Grand Cenote, instead of walking down the main stairs, walk all the way to the right. There, you'll find an offshoot of the main cenote that is both a little tucked away and very shallow. It even has it's own set of stairs. The shallow water made it the perfect place to hold and swim with Sally. Beaches, ruins, and cenotes are the big draw in Tulum, but there's more! 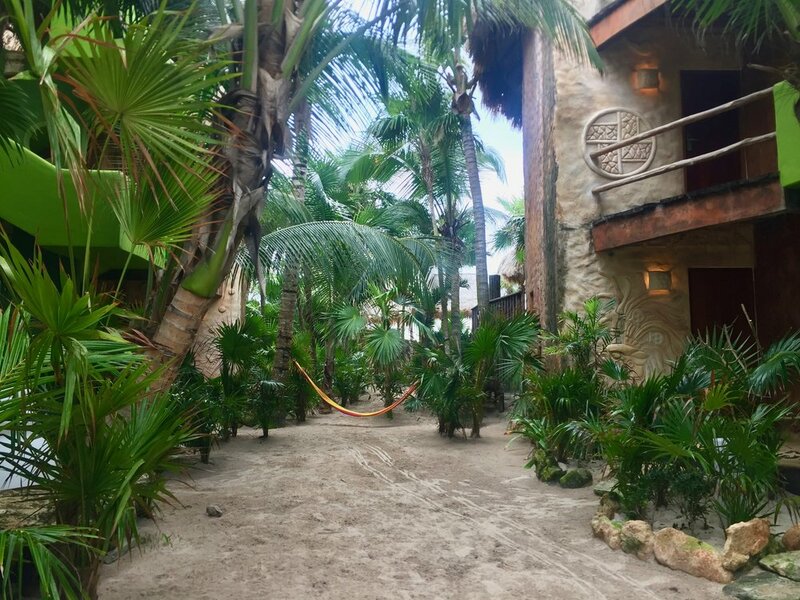 The Tulum town center is about a 5-minute drive from the strip of hotels (there is a nice bike path to get there as well and many of the hotels offer bike rentals). On the way to town is a huge supermarket, Chedraui, where you can stock up on food, beer, water, and anything else you may need. There are plenty of restaurants that offer great food at a fraction of the cost of the restaurants you will find on the main hotel drag (check out Antojitos La Chipapaneca for excellent cheap tacos in town). 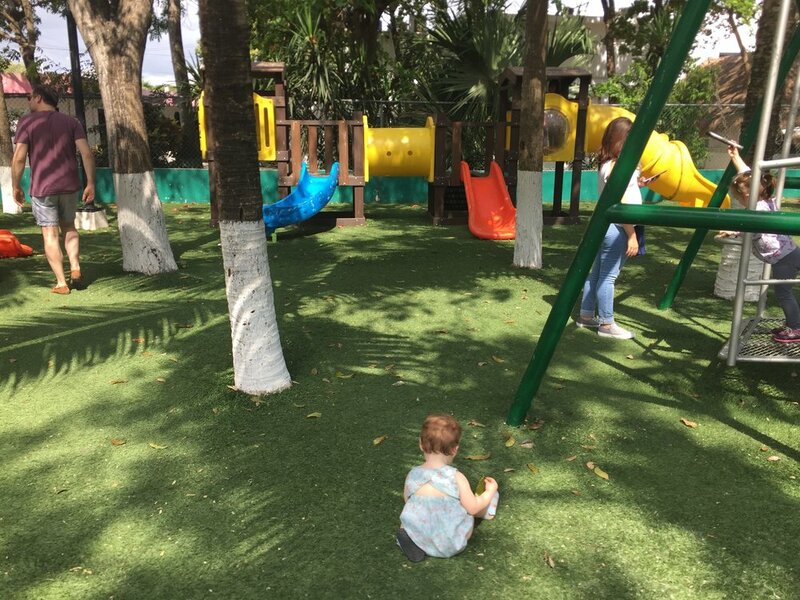 There is a lovely park and playground right in the center of town, which was a perfect break for Sally to get our of her stroller and run around. And finally, the main street in town is filled with plenty of souvenir shops (a favorite Harris family activity). And last but not least, Tulum offers plenty of tasty casual to high-end restaurants near the beach hotels (although they often have big-city prices). Everyone SWEARS by Hartwood. I am not a foodie, so we didn't bother to make reservations in advance for this highly in-demand restaurant, but I've heard multiple people say that it's in their top 3 meals of their lives! We had a good meal at Cafe Jaguar, which has a stunning setting nestled in the jungle. An excellent choice for tasty tacos on the beach is Taqueria Eufemia. It's good vibes day or night and a fun path to get there from the road which contributes to the feeling of magic! All in all, Tulum is a great vacation getaway. It's relatively easy to get to, has plenty to do, and feels high-end without being pretentious. A big thumbs up from The Harrises!